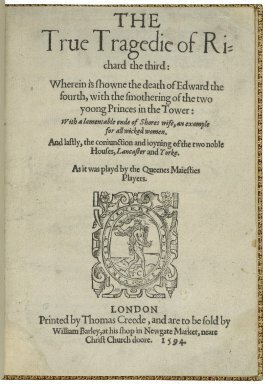 THE True Tragedie of Richard the third: Wherein is showne the death of Edward the fourth, with the smothering of the two yoong Princes in the Tower: With a lamentable ende of Shores wife, an example for all wicked women. And lastly, the coniunction and ioyning of the two noble Houses, Lancaster and Yorke. As it was playd by the Queenes Maiesties Players. LONDON Printed by Thomas Creede, and are to be sold by William Barley, at his shop in Newgate Market, neare Christ Church doore. 1594. Title page imaged from Folger call number: STC 21009. Image is not from the transcribed copy. Wiggins suggests a best-guess creation date of 1589, range 1588–91.